Today’s students communicate in fundamentally different ways than their non-millennial predecessors. They use their smartphone’s keyboard, camera and microphone to express themselves, they spend 3.1 hours a day consuming social media, and they almost never read emails not directly targeted to their immediate and personal interests. We are all witness to the biggest shift in communication since the move from radio to television - and the students right outside your office window are the ones leading this revolution. Next year’s students will have different media habits than this year’s. There will be new social media platforms, new slang, new trends. Does your department have a plan to keep your content relevant and easily accessible? As technology continues to advance, email open rates will drop and students will figure out how to avoid generalized, spam-like messages they don’t believe are meant for them in the first place. But I’m not here with a negative message. I’m here to share a few thoughts on high impact practices to get and keep in contact with your students. Focus on your website. Let’s face it - nearly all forms of communication are interruptions. Announcements, emails, phone calls, texts, etc.... We hate that. Give users an engaging place, a destination, where they can consume your content - the stuff that matters to THEM - at their own pace, on their own time (we’re pretty sure you don’t want to start offering office hours at 2:00 AM on a Thursday). Personalize your emails. Show your students that you care about what matters to them and send them information that is tailored to their interests. Promote the fact that your audience can sign up to receive notifications based on their preferences. Major in Botany with a minor in French Lit and want to intern internationally? - we’ve got career advice. Social Media, Social Media, Social Media. Remember when we said that millennials spend 3.1 hours a day on their phone, well ⅔ of that time is on social. Social media is the one place where you’re not interrupting them. Try to share your content across several platforms. To quote an article from BostInno.com, “You can find most Millennials spread across the main social networking sites such as Twitter, Instagram, LinkedIn and of course, Facebook. So keep promoting your content via these channels!”. If possible, find out which platforms are most popular on your campus: you might take a survey or reach out to a few students. Stay ahead of the curve. Let your students know that you're keeping pace...you don't want to be adopting a social media platform when they've already moved onto the next one. And finally, take it seriously: we recommend getting fluent with social media yourselves, rather than simply passing the job off to a student. The Classroom. The only place students have to be. Consider partnering with faculty, especially those whose subjects feed directly into particular career paths. You could even run a lecture or blog series in which professors discuss their career path history. Promote high-profile classes to specific career communities to bridge the classroom / real world gap. Clubs. Encourage student clubs to create an online career community where they can share resources and opinions and post specialized content targeted uniquely to members. Believe us, the peer perspective is going to win our attention every time. Host events...with food. We probably don’t have to explain the attraction of this one… And don’t force yourselves to make it career-themed, get creative! Is football big at your school? Plan and promote a Career Center tailgate! Students can get to know your staff over wings during halftime. (Let us know how it goes, and don’t forget to document for your career center Instagram page). Go old school. Everyone notices a well-placed flier. Spark student curiosity with a relevant and slightly edgy meme or catchphrase. Bonus points for creating a splash page on your website and promoting through social. School newspaper. You could take this one in several directions. At the very least, you might put a small advertisement in each issue (or in the first issues of the beginning of the year, or during job-application time). Tell your students where your office is and encourage them to drop in! If you have walk-in hours, this would be a good place to promote them. Be funny, be current! And make friends with your editor so that they're willing to talk about what a success your latest event-with-food was. You could take this idea even further and have a regular column on career-related topics. Student ambassadors. Students listen to other students. 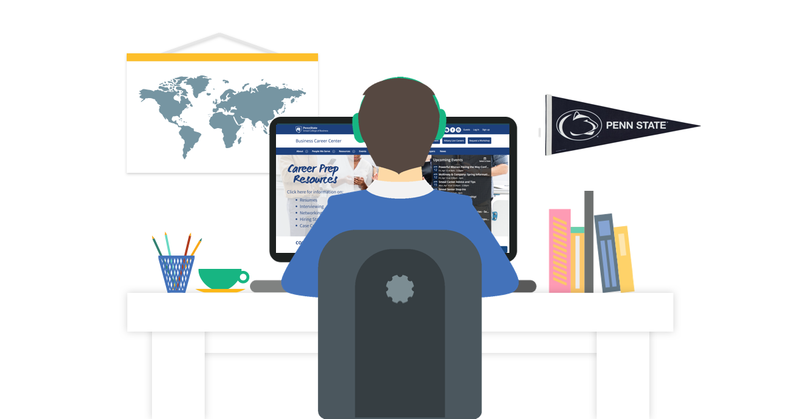 Bentley University Career Center, relies on senior student ‘Career Colleagues’ to advise freshman and sophomores early in their career exploration experience and inform the digital strategy of their career center website. Never underestimate the millennial motivation! Here at uConnect, we truly believe that serving students is predicated on being able to communicate with them - and we continually update our software with this idea in mind. about how we do what we do. Want to learn more about how to implement some of these strategies? This video is a must watch for anyone working with, coaching, parenting or just plain interested in Millennials.